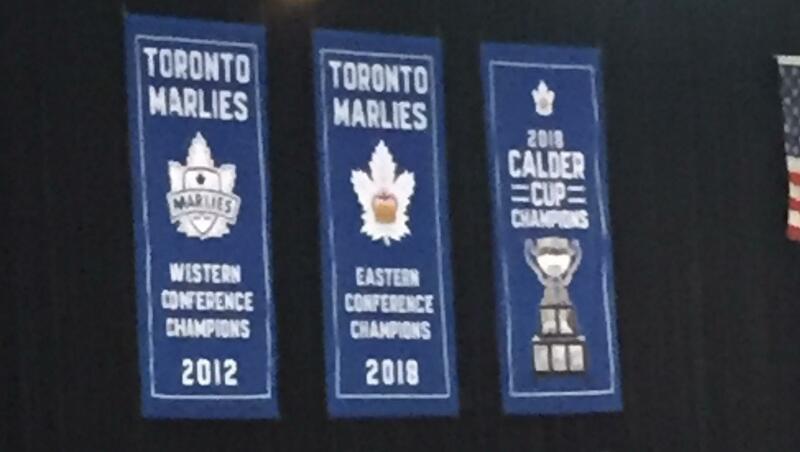 On a day when the Toronto Marlies opened their home season by raising their 2018 Calder Cup championship banner, the team dropped a 5-3 decision to the Cleveland Monsters, the AHL affiliate of the Columbus Blue Jackets. Toronto spent much of the first period under siege and goaltender Kasimir Kaskisuo was left to his own devices early in the period. After Cleveland vaulted to a 2-0 lead just over five minutes into the game, it took the Marlies until the 15:49 mark to respond. On a power play, Chris Mueller converted a nifty diagonal cross-ice pass from Dmytro Timashov to get his team on the scoreboard. But the home team gave the two-goal cushion right back to their opponents before the first intermission. The Monsters took advantage of some sloppy defensive coverage and scored their third goal, off the stick of Michael Prapavessis, after defenceman Andreas Borgman seemed caught in no-man’s land, not knowing which attacker to cover. Cleveland appeared to put the game away early in the second period when Zac Dalpe scored twice, the first goal coming on a Monsters two-man advantage. But just sixteen seconds after Dalpe’s second goal, Sam Gagner unleashed a wrist shot from the left faceoff circle and past goalie Jean-Francois Berube to gain some momentum for the Marlies. Calle Rosen rounded out the scoring with a point shot blast after Jordan Subban and Sam Gagner created a strong cycle in the Monsters’ zone. The third period was goalless, despite the Marlies’ fervent effort to climb back into the game. Toronto outshot Cleveland 20-2 over the final twenty minutes.